Make leak-proof gaskets and return equipment to service immediately! Permatex’ premier instant gasket maker was designed as a replacement for conventional gaskets. This elastomeric “formed-in-place"material is more reliable and longer lasting than pre-cut gaskets. It is blowout resistant and protects against leaks and seepage caused by vibration and thermal expansion. 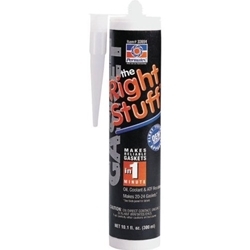 Formulated to meet or exceed performance standards for long-term sealability, durability and handling, this material is used on OEM production lines and specified in their service parts programs.